Kanban is a concept that relates to obtaining materials or required items "just in time" for their introduction into the assembly or process. The system of JIT or the just in time process was initiated by the Japanese firm Toyota in the 1940s. Kanban is a system to signal a need for action. This can be done by cards on a board (which is the traditional way) or by other devices that are used as markers, indicating the need to take action. Taiichi Ohno, the man who conceptualized the JIT system, says Kanban is the means to achieve JIT. Toyota felt the need in the 1940s to reduce costs by introducing proper inventory stocking techniques of required assembly parts. First, they studied supermarkets to understand how supermarkets ensure their shelves are always stocked with the materials that the customers want and in the required amount. Customers could always be assured of a constant supply of product and only pick up the number of items that they immediately required. They knew a future supply of wanted product would be available whenever desired. Toyota reasoned that if they could ensure this same supermarket guarantee of required parts for their assembly lines, there would be less of a need to maintain high inventories which in turn, drive up costs and storage requirements. Toyota also began maintaining strict controls on defective products, which in turn were kept from entering the process. 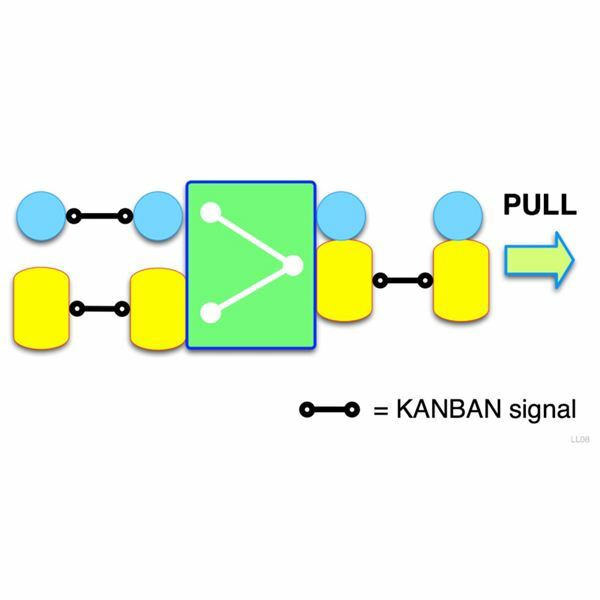 Kanban controls the rate of production by passing the demand for raw materials through a system of customer-store processes, which ensures that materials are received only when required. With Kanban, each process identifies only those products that are required for that exact process until that process is complete. Each subsequent process continues by only using products that are required for the next step of processing, and so on. Thus, production is equalized in all processes and stabilizes the production by fine-tuning inventory demand and requirement processes. A very simple method of implementing Kanban is the use of a three bin system. One bin is available on the floor of the production unit using the product. A second bin is available at the inventory department of the factory where the production staff obtains raw materials. Finally, a third bin is available at the premises of the supplier who has been selected to deliver the materials. Each bin contains cards with detailed information showing inventory numbers available within the bins and the date which they were received. During the process, the factory floor uses the materials from the bin and, once the bin is depleted, its Kanban card is returned to the inventory department. The inventory department immediately replaces the bin with a full bin obtained from the supplier or vendor. In turn, the inventory department sends the empty bin to the vendor or supplier for replenishment of materials. Suppliers and vendors stay on top of replenishing needed materials at their location, keeping them ready for the next exchange. This three bin method, therefore, doesn't require on-site storage of materials until they are required. Such bins, represented by Kanban cards, are created for each of the items required in the production process. The number of Kanban cards depends upon the actual number of the items required during each stage of the process. The control during the assembly is achieved by identifying every Kanban card needed to complete the assembly or production. Hence, Kanban is considered an effective tool in the Just In Time inventory process within an assembly line production.